William Jefferson Clinton, the first Democratic president in six decades to be elected twice, led the U.S. to the longest economic expansion in American history, including the creation of more than 22 million jobs. After leaving the White House, President Clinton established the William J. Clinton Foundation with the mission to improve global health, strengthen economies, promote healthier childhoods, and protect the environment by fostering partnerships among governments, businesses, nongovernmental organizations (NGOs), and private citizens to turn good intentions into measurable results. Today the Foundation has staff and volunteers around the world working to improve lives through several initiatives, including the Clinton Health Access Initiative, which is helping 4.5 million people living with HIV/AIDS access lifesaving drugs. The Clinton Climate Initiative, the Clinton Development Initiative, and the Clinton Giustra Sustainable Growth Initiative – are applying a business-oriented approach to fight climate change worldwide and to promote sustainable economic growth in Africa and Latin America. In the U.S., the Foundation is working to combat the alarming rise in childhood obesity through the Alliance for a Healthier Generation, and is helping individuals and families succeed and to increase small business growth in underserved communities through the Clinton Economic Opportunity Initiative. Established in 2005, the Clinton Global Initiative brings together global leaders to devise and implement innovative solutions to some of the world’s most pressing issues. So far, more than 2,100 Clinton Global Initiative commitments have improved the lives of 400 million people in 180 nations. In addition to his Foundation work, President Clinton has joined with former President George H.W. Bush three times – after the 2004 tsunami in South Asia, Hurricane Katrina in 2005, and Hurricane Ike in 2008, and with President George W. Bush in Haiti in the aftermath of the 2010 earthquake. The Clinton Foundation also supports economic growth, job creation, and sustainability in Haiti. 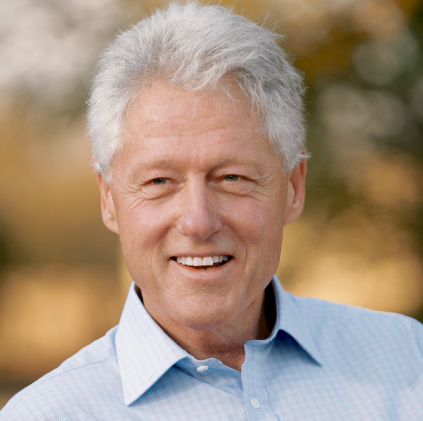 President Clinton was born on August 19, 1946, in Hope, Arkansas. He and his wife Secretary Hillary Rodham Clinton have one daughter, Chelsea, and live in Chappaqua, New York.